Every parent I know struggles with how to teach their kids about money. And even though I’m a financial planner, I’m no different. Below, I’ll walk you through how my wife and I are giving it our best shot. I’ll cover how we address saving, giving, investing and how allowances fit into it. As I was writing this, the information kept organizing itself around certain principles we’d like to pass down to our kids. So, that is how you will find it below: a statement of “principle” followed by how that has played out into practice with some real-life examples. Along the same lines, my encouragement to parents is this: start with the end in mind. What’s important to you about money? And is that something you want to pass along to the next generation? If so, how could your practices reinforce those values or principles? Principle: We’ve learned (and want to teach our kids) that many great ideas and intentions are foiled by unnecessary complication. So we’re striving to keep things simple both for our kids and for us as parents. Practice: Split Money into Three Categories: Our clients who are most successful at achieving their goals tend to track their spending, but they do so with as few categories as needed. When we started teaching our kids about money, we got them three mason jars and labeled them Save, Spend, and Give. We also encouraged them to put at least 10% in Give and 10% in Save. This worked fine for the occasional birthday cash or $1.50 from selling a piece of “artwork” to a neighbor. But it fell apart when the kids would go grab their “Spend” jars whenever Millie had to drag them to Target. Or when they lost the jar. Or when they “accidentally” moved money from Save to Spend. Practice: For The Kids, We Did Away With Coins and Paper Money – My solution was to track everything with a budgeting app that allows me to create virtual “envelopes” that act as the physical jars. I use the “GoodBudget” app but there are plenty of other options. So now, when the kids each make $5 from their lemonade stand, they admire the paper money, hand it over to me, and I put it in my wallet. Then I open the App, put in a quick transaction that shows a $5 deposit into each kid’s account and we talk about which of the three virtual “envelopes” (Give, Spend, Save/Invest) to fund. Conversely, when a kid wants to spend money, we know their account balances in a moment’s notice. If they want to buy something from Amazon, I buy it on my credit card, then input a transaction in the App that deducts money from their “account” and I choose which “envelope” it should come from. Again, all of their dollars are really just in our joint checking account. We’re not actually moving money around, but rather keeping track of earmarked dollars. Principle: Thankfully, Millie encouraged me to start giving money away when I was earning lowly golf cart-boy tips in college. Since then, we’ve made a point of donating a meaningful portion of our income every year. Over time we’ve refined our definitions of what we’re passionate about. Today, this is some of our favorite money to spend. We’d love to give the “gift of giving” to our kids. Practice: Set Monthly Giving Amounts and Talk About Giving Often – Whenever our kids receive money, we encourage them to put at least 10% in their Give envelope (tracked in the App.) Currently, they mostly donate their money to our church, but we also try to include them in talking about the other causes we’re passionate about. Principle: As much as I’d like to teach our kids about stocks and P/E ratios, I’d rather them grasp the benefit of investing early and often. 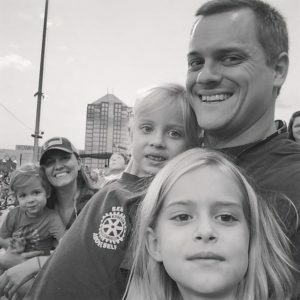 Practice: The Bank of Mom and Dad Pays Their Investment Returns – The main difference between our Save/Invest and Spend “jars” is that our kids earn an investment return every month on any dollars they have designated as Save/Invest. I figured that if I was going to incentivize them to Save rather than Spend, a 1.9% savings account wouldn’t do it. But I also didn’t want to scar them for life (at least not in this area) by subjecting them to the hard truths of a possible stock market correction. Instead, I decided to pay them a grossly exaggerated 1% MONTHLY return on any balance in their Save/Invest. This makes the math simple for me (if there is $100 in Save/Invest, I simply credit them another $1 that month). The key is that we only pay an investment return on the money in Save/Invest, not on the money in their Spend. To drive the point home, I created a Google Spreadsheet that details the impact of compounding over the kid’s lifetimes. It assumes their allowances (more on that later) and their actual ages. As I walked them through the cells, Grayson (11) was amazed, Finley (8) was indifferent, and Everett (5) wanted to watch Power Rangers. Baby steps. At some point we’ll transition from the “Bank of Mom and Dad” to earning their returns from “Mr. Market”, but for now, this seems to do the trick. Principle: A common trait among our most successful clients is discipline. Whether that means slugging it out through years of medical school or simply delaying a purchase that all the Joneses seem to have. We would like to instill this same trait in our kids; which seems even harder to do in the age of social media and instant movie downloads. Practice: Four Week Cool Down Period – I referenced our three “jars” above: Give, Spend, Save/Invest. 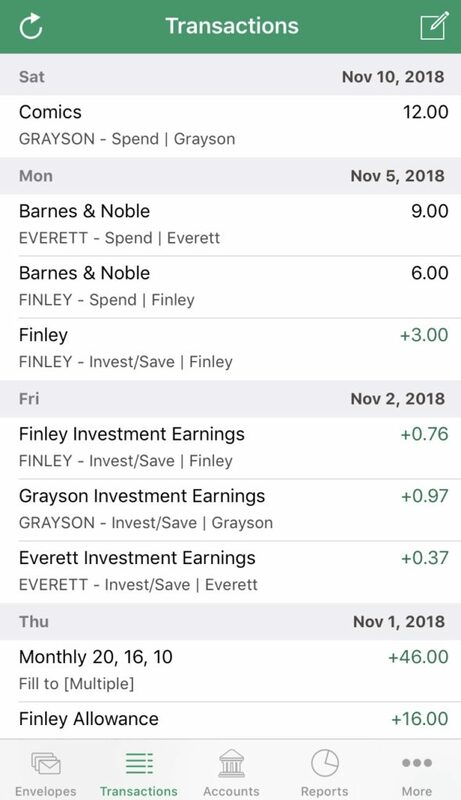 The other difference between the Spend and Save/Invest “jars” is that we enforce a four week “cool down” period on spending any of the Save/Invest money. So, when Finley wanted to buy a $40 Lacrosse stick, she wrote “Lacrosse Stick $40” on a sticky note, put it on the fridge, and we talked about it every now and again over the four weeks. In her case, she didn’t end up buying it. Instead, she found one later for $5 and bought it with her Spend (not her Save/Invest) money. Success! Practice: Forget About Your Money – Another form of discipline is to intentionally “forget” about your money. We found that when our kids held on to paper money, they were much more inclined to spend it. But when we tracked it via the App, it was in accounts that they didn’t see, and they were much more inclined to save it. Principle: We think being able to work is a privilege and being a family means we share the load. We also believe that as we develop skills (or simply get older) we should take on more responsibility. With those responsibilities come both payment and accountability. Practice: We Pay Allowances and Have Performance Reviews – We started this year by paying each kid 2x their age per month (So, $22 for the 11-year-old.) With that, comes added expectations for chores for each kid. Some are defined (they do their own laundry, have their own days to unload the dishwasher, and even clean toilets! ), but plenty are ad hoc. Over the course of the month, Millie and I share an Apple Note with sporadic details of how the kids have tackled their chores. If they do it sloppy or with plenty of complaining, we make a note. When it comes time to pay out the next month’s allowance, we take the last month’s “performance” into account. We’ve lowered an allowance 3 times and it has helped to drive home that allowance isn’t a handout. REAL TALK: Keeping up with the “performance” talks have been more tedious than I wanted and we’ve defaulted to giving them the standard allowance plenty of times when they might have deserved a decrease. I think we’ll move to quarterly going forward. Principle: In our family, we believe (just like we hear on Sunday right before the offering plate is passed around) that “everything we are and everything we have has been given to us.” But even if we held a different theology, the same would be true for the people in my life. I’m the product of a 10th-grade teacher who wouldn’t give up on me and a gracious Trust Officer who gave me my first job out of college. I’m the product of a wife who gave up three years of Spring weekends for me to study for my CFA and the 100+ client families who trust me to help them financially. We all have an obligation to be responsible for our resources (things, time, and money) but we also believe we’re meant to enjoy them as well. Finding that balance is hard, but a lesson we all need to learn. Five year-old Everett doesn’t get to buy the Swiss Army knife he really wants (we went with the wooden one instead). If I had to sum it all up, we’d love to teach our kids that money is a great servant, but a horrible master. We don’t do it perfectly, but my hope is that by adhering to some of these principles and the practices that come out of them, our kids will grasp that how we think and act around money is more important than how much we have.